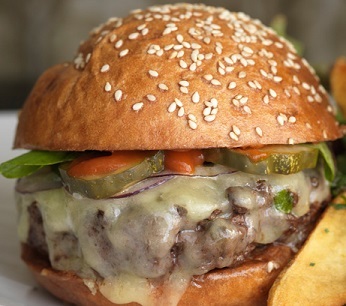 This Hot Belly Buster Burger is so-called because of the ingredients that include jalapeno peppers and Tabasco sauce and its size - 1/2 pound of beef. The hamburgers I usually prepare are a third of a pound of ground beef. But on certain days when there is a special sports event on TV, I make the Hot Belly Busters for guests in the restaurant. Most of these sell in the lounge. 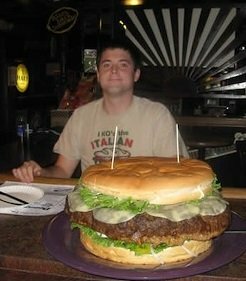 And of course, even though this is a large hamburger, it is certainly not one that competes for the world’s largest. The current record is 123 pounds! I don't participate in the "burger wars for size" that seem to be a rage periodically in the U.S. I like to focus on quality, instead. Preparation time: 10 minutes. Makes 8 burgers, 1/2 pound each! 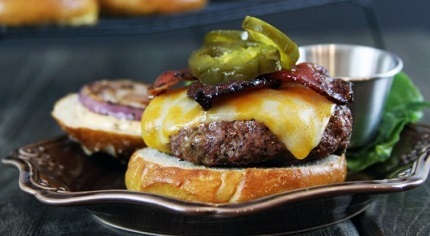 Enjoy your Hot Belly Buster Burger Recipe and the company of those you share it with!